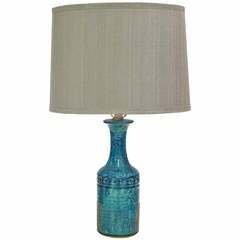 Hollywood Regency Bitossi style pair of table lamps in carved ceramic with blue & aqua glaze, mounted on gilt wooden bases. The pair was designed in the 1960s in Italy and is in great vintage condition with age-appropriate wear. Fully restored with all new wiring and hardware, including a double socket cluster. The height to the top of the ceramic body is 24 in ( 61.5 cm). The noted height is to the finial. *Please note the shades are for display purposes only. A Hollywood regency ceramic table lamp in shape of a seated grinning monkey holding an urn. The piece is in good vintage condition with age-appropriate wear. Ceramic lamp with aqua and green glaze newly rewired with black silk cord. Includes grey silk shade. Base diameter is 4.25. Substantial Italian single table lamp similar to the works by Aldo Londi for Bitossi. Beautiful earthtones with a fired stoneware matte finish. Rewired, lamp shade included.